Two people were killed in separate incidents. John Alderdice, the leader of the Alliance Party of Northern Ireland (APNI), addressed his party conference in Belfast. Representatives of Sinn Féin (SF) said that they needed a “period of consultation” with their membership before they could sign the Good Friday Agreement. Bill Clinton, then President of the United States of America (USA), said that he would visit Northern Ireland if it would help ensure the success of the Agreement. Ian Paisley, then leader of the Democratic Unionist Party (DUP), launched a DUP campaign calling for people to reject the Agreement. 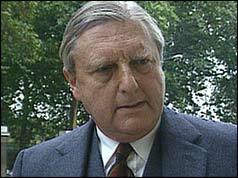 William Thompson, then Ulster Unionist Party (UUP) MP, announced that he would be supporting the DUP campaign. Efforts to break the deadlock over decommissioning resumed at Stormont with a series of meetings, including a round table session involving all the parties supporting the Good Friday Agreement. Prior to the resumption of talks, Marjorie (Mo) Mowlam, then Secretary of State of Northern Ireland, issued a statement. Mitchel McLaughlin, then Sinn Féin (SF) chairman, also issued a statement claiming that the Hillsborough Declaration (1 April 1999) moved away from the Good Friday Agreement and as such, was formally rejected by SF. The Declaration was also rejected by the Progressive Unionist Party (PUP). The Northern Ireland Police Authority (NIPA) strongly defended Ronnie Flanagan, then Chief Constable of the Royal Ulster Constabulary (RUC), against allegations of “indifference” made in the report by the United Nations (UN) Special Rapporteur on 12 April 1999. The total number of prisoners released under the terms of the Good Friday Agreement was reported as being 257. 131 were Republican, 118 Loyalist, and eight had no classification. Killed in van bomb explosion, Main Street, Ballymoney, County Antrim. Inadequate warning given. Scottish visitor. Shot during street disturbances, Crimea Street, Shankill, Belfast. Off duty. Shot near to his home, Tynan, near Middletown, County Armagh. Off duty. Shot at his shop, Keady, County Armagh. Shot at his home, Thornhill Crescent, Twinbrook, Belfast. Alleged criminal. Off duty. Shot at his wife’s shop, Antrim Street, Lisburn, County Antrim.